What is Digital Asset Management? Digital asset management (DAM) offers an effective solution for any online business to store, maintain, categorize, locate, manage and share all types of digital files. With Adrecom, we make this central digital library solution simple to role out and use for all your employees, customers, partners, and vendors. Positioning and maintaining your enterprise as a leader in the field is largely a function of the creative utilization of your digital assets across the spectrum of media channels. 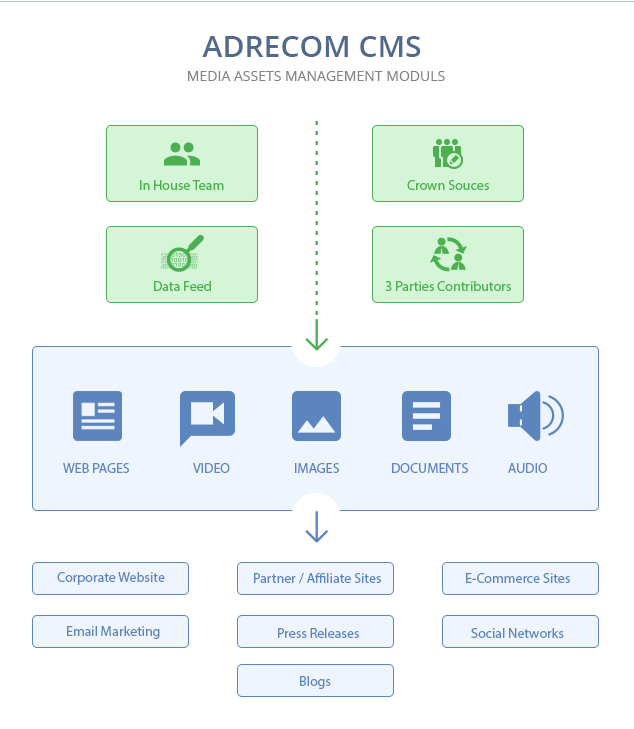 From static images to videos, to podcasts, to flash files, Adrecom's Content Management System (CMS) enables you to cull, organize and distribute these assets, maximizing their impact. The simplicity of a single user interface, backed by Adrecom's sophisticated technology, enables marketing and media professionals to streamline content library management, approval processes, tagging, and publishing.Web based access to centralize storage of all media assets such as video, images, audio, documents and other files. Advance searching tools including multiple criteria refined search, keywords, tags and meta data base search to simplify work with large data collections.